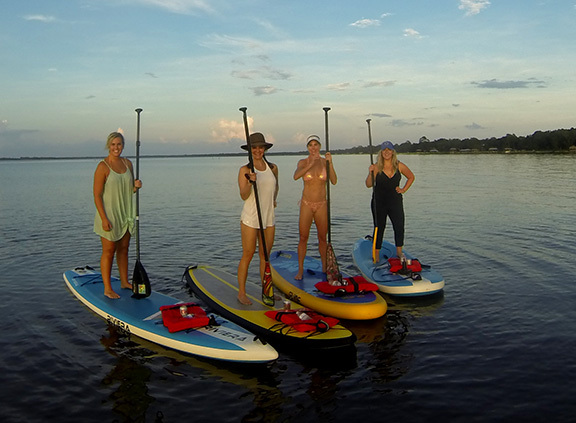 Join us for a Stand Up Paddleboard Adventure offering one of the only SUP Sunset trips in the area! The trip starts at our Paddle Hut Hideaway… located just 5 minutes north of Grayton Beach. Learn the basics in our calm secluded lagoon, then paddle down the canal and out into the beautiful Choctawhatchee Bay and paddle to The Bay Restaurant for Happy Hour. Arrive at the area’s hottest new hang out via paddleboard and enjoy a cold beverage & appetizer and then paddle back enjoying the sunset and looking for dolphins dancing in the Bay. It’s about a 45 minute paddle to restaurant, we hang out there for about an hour, and paddle another 45 minutes back. All gear, professional instruction, photography and tour guide are provided for this 3 hour adventure. Food and beverages are optional and not included in price. Please call directly to book for children age 8-12. Be sure to also check out our AM SUP Yoga, Sunset SUP Yoga, Brunch Paddle, and our magical Full Moon Paddles! And, if you don’t want to paddle all the way to the restaurant, check out our Sunset SUP Tour.